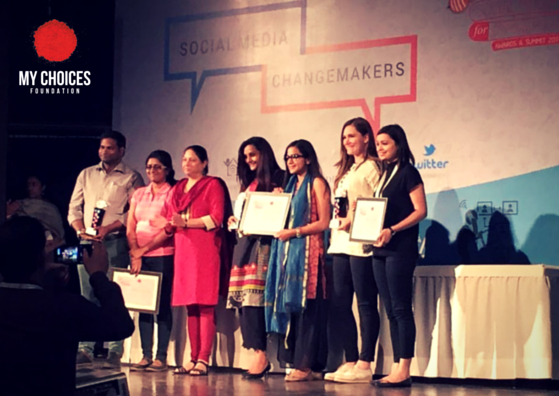 We are thrilled to announce that My Choices Foundation won Grand Jury Award for Women Empowerment at the Social Media for Empowerment Awards, 2016 by Digital Empowerment Foundation. We must say a BIG thank you to all of our co-campaigners (that’s YOU!) for your contribution to our campaigns through profile photo changes, online pledges, making videos, writing poems, taking photos, and sharing your stories. As an NGO focussed on providing grass-roots services to victims of domestic violence and human trafficking, it’s easy to wonder what we’re doing in the digital advocacy space. This is our vision in a snapshot. We were proud to stand with Breakthrough, and Safe City as tri-winners of the award. Both NGOs do amazing work in effort to keep women in India safe from sexual harassment. Make sure you check them out, if you haven’t! This was Digital Empowerment Foundation 3rd edition of Social Media for Empowerment Summit and Awards, 2016. SM4E is a platform for the recognition of social media-driven initiatives taken for the development of masses. It is also an opportunity to meet innovators and social media experts. We are honoured to have been selected as the Grand Jury Award recipient, and look forward to achieving more for the cause in the future! #Respect2Protect – Indian Cricketers from My Choices Foundation on Vimeo. We were interviewed by the SM4E team interviewed us for our insights into digital campaigning, and because we prize investment into others, we’re sharing that interview below. What was the motivation behind starting the initiative? Our NGO leadership has long had a vision to include and champion men in the cause of ending violence against women and girls. This part of our DNA is reflected in the inclusive approach of our programs that invite men to be a part of the process in ending domestic violence in their homes and communities and keeping their girls safe from trafficking. Our online campaigns are an extension of this vision. We had the incredible opportunity to connect with the Indian Cricket team, and ask them to contribute to a campaign. We had a short window of time to execute the plan, but we were already ready with the messaging – we knew that men speaking out about respect for women’s safety, independence, mobility, dreams and capabilities would be phenomenally empowering for women and even more game-changing for men. Respect2Protect is a campaign for men, by men about how men can be the change. We believe that men are at least 50% of the solution to ending violence against and exploitation of women and girls. What were the challenges you came across? This was My Choices Foundation’s first full-fledged digital campaign. We had never been a part of anything like it before. So there was a big learning curve the whole way through, from the production phase to the management phase. We had to learn on the go. What made all the difference was the diligent work of our team that worked in overhaul mode to get things done and volunteers with expertise in digital tools. The lash back we got from those who disagreed with the campaign was expected, and didn’t amount to enough to actually be considered a challenge. How are you planning to scale it up? The scale of our Social Media initiatives will be increased through future campaigns as well as the ongoing, expanding reach of #Respect2Protect. We are already planning our next campaign, again geared towards men and boys, focussing on the role of fathers. Stay tuned! What does winning SM4E Awards mean to you, and how will you leverage it? Winning the SM4E Award for Women Empowerment is a very meaningful accolade. We appreciated the prestige of the Grand Jury and the rigor they applied to narrowing on finalists out of so many nominations. This created a confidence in finalists that, if won, the award was indeed a great accolade. Additionally, the quality of the work and brand of the fellow finalists was further validation of the honour it was to have made it as a finalist. It was particularly interesting because the finalists were a combination of NGOs, government, and corporates alike. It is one thing to stand out among our fellow-resource strapped NGO peers, but to also be recognized along side groups and campaigns with very different organizational structures was particularly exciting. The Award is an objective confirmation of the quality and impact of our work in the digital sphere. it will certainly help raise our NGO’s public profile and help us in fundraising as well as garnering important partnerships. It is also an impactful way affirming the good faith of every donor, volunteer and partner of our work who has believed in and championed our work so far. How did you arrive at the technology you used for the project? Goal of virality: The goal of the campaign is that it would have a “by the people for the people” feel to it. While it utilized the voice of celebrities, it encouraged every-day voices to become THE VOICE. Campaigns run on TV and/or in print just don’t have this feel or capability. Social media relies on real people for its success. People are able to own the cause, and express it how they relate to it. Versatility and Timing: We had very limited time to produce the campaign and get it running. Social Media provides you with control over these factors in a way that traditional campaigns do not. Also, it allows for flexibility for the campaign to adapt to keep up with the viral uptake. All the mediums used were chosen for their potential to encourage conversation and individuality, and to disseminate multiple rounds of collateral tailored to the responses received. Resource availability: Digital campaigns allow hard work to carry a message further than financial resources. There are an arsenal of tools available to anyone with a message that help you leverage it, if you have the skills. What are the learning’s you would like to share with us? We have just 3 simple tips for anyone planning a campaign for social change. People are looking for honesty, practicality and that something special. If we want to design campaigns that will speak to people, we have to make it simple and to the point enough so that it resonates as truth. Yet, people need more than words. What happens after the initial buy in to the campaign is so important to the longevity of passion, the follow through of getting help, and the completion of transformation. Our campaigns feature different layers of action, and more crucially, offer to recourse to those who need help. Finally people on social media are desperate for social currency. They desire something special – a new perspective, an influential voice, an unlikely story – to take ownership of and spread among their peers. These three aspects of a campaign are what we have found to be so successful in catalyzing meaningful change. Strategic Expansion: Find out why our Warangal team is growing!